Hi, my name is Shannon, and I am definitely not a Pinterest-worthy chef. I have a few go-to recipes that I make weekly because they’re easy and they’re so second nature at this point that I don’t even have to think about what I’m putting in. This is great, because dinners are really easy, however, it gets a little boring, and after a while, even my best dishes start to get tasteless. I’m always scouring Pinterest for helpful hints for meal planning and meal planning menus, but a lot of the time they are dishes that my family won’t (or can’t) eat, due to dietary restrictions or personal preferences, or they aren’t very healthy options. Then, when I do find recipes that I like and try to create a menu, I get stuck trying to figure out a grocery list, or I have a ton of leftovers at the end of the week that go bad because none of the dishes have anything in common. Enter No More To-Go: a daily healthy meal plan service for simple and affordable healthy meals! 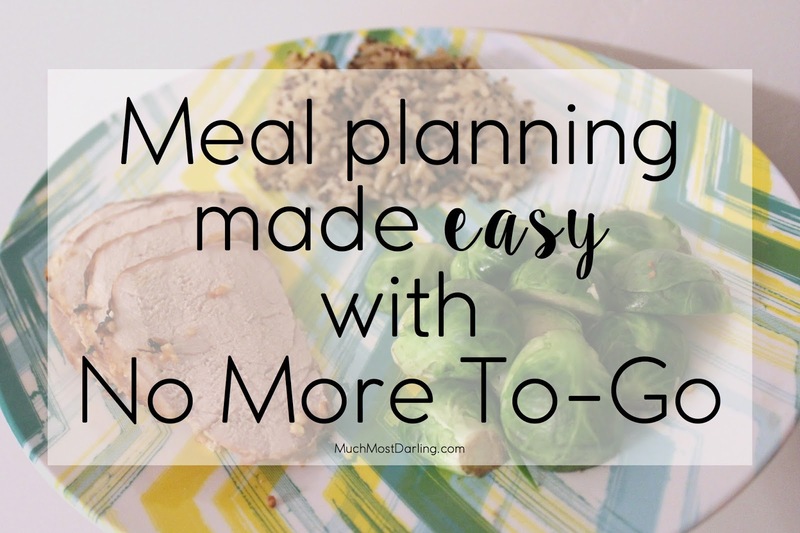 I’ve gotten to try out a month of awesome customizable meal plans for my family from No More To Go, and it has made meal planning and grocery shopping SO much easier. No More To Go literally takes all of the guess work and hassle out of creating a healthy menu for my two dudes and myself, as they actually send my dinner menus and grocery lists directly to me via email every Friday! How cool is that? No searching websites or browsing a ton of different pins – it’s all scheduled to automatically arrive in my inbox, and a quick click takes me straight to my lists! I love that they send me my lists on Friday, because we typically do all of our grocery shopping on Saturday and Sunday afternoons, and it gives me plenty of time to get myself organized. Each week I am sent five complete menus with fresh, seasonal ingredients and simple recipes – so simple even a super novice chef such as myself can easily throw together, and one of the best parts? I don’t need 500 kitchen utensils to accomplish any of the dishes. Because No More To Go does all the work for me, I’m not only saving my sanity, but I’m also saving time, and with no wasted ingredients I’m saving money as well! This month’s dinners have been such a breeze that I decided to continue my subscription, because at only $7 / month it definitely fits into my family’s budget! Cilantro-Lime Skillet Chicken with Crispy Potatoes and Asparagus recipe. This meal literally took five minutes to throw together, and less than 30 total to cook – it doesn’t get any easier than that! Plus, the cilantro lime sauce is amazing, and I want to pour it on everything I come across now. Red Snapper and Pesto Cream Sauce with Roasted Zucchini and Herbed Orzo recipe. The Hubs isn’t a huge fan of Red Snapper, and we had a bunch of tilapia in the freezer just waiting to be turned into something delicious, so we switched the fish and it was heavenly. We also switched things up a bit and used brown rice and roasted squash and zucchini instead, since that’s what we had in our pantry and refridgerator, and the dish is definitely on our repeat list. Slow Cooker Chipotle Pork Soft Tacos and Borracho Beans recipe. Trust me on this one – you’re going to want to double this one to have for leftovers! Slow Cooker recipes are my favorite, and No More To Go actually suggests making extra and freezing your extra, but after dinner one night and lunch the next day, there were no leftovers in sight! Broiled Flank Steak and Brussels Sprouts with a Creamy Feta Sauce recipe. Flank steak is one of our favorites, and this dish is no exception! We switched out the brussels sprouts for broccoli and asparagus because I may or may not have eaten all of the brussels a few nights prior, so that’s what we had on hand and the feta sauce has become a new favorite. We also forgot the green onions, so if you’re not a fan of those, this dish is still delicious without them! Bold and Juicy Pork Tenderloin with Roasted Brussels Sprouts and Couscous recipe. I highly suggest making the marinade ahead of time and letting the pork sit in it overnight – the flavors are awesome! Plus, bacon and brussels sprouts? Yeah, YUM. Once again we modified this slightly to use up what was in our pantry, so instead of the couscous we used a brown rice and quinoa mixture. And that’s just a small sampling of the past four weeks of meals we’ve enjoyed! Sign up at No More To-Go’s website (feel free to sign up for a 14 day free trial first). Pick Your Plan. Choose a meal plan that best fits your lifestyle and family size. Each meal plan comes with Kid, Vegetarian and Gluten free options, so you’re sure to find a way to accommodate your family’s tastes! Get Recipes Every Friday! Each week, a reminder email arrives in your inbox- complete with menu highlights and links to each meal’s recipe page. Shop (and Save!). Each meal plan includes a detailed grocery list organized into categories to get you in and out of the store quickly. Cook! Each week’s menu is carefully tested and provides a variety of proteins, grains, and vegetables. No More To Go makes sure that each recipe is easy and do-able after a busy day. Serve and Relax! No More To-Go does the work but you can take the credit for all the delicious and healthy meals. Want to try it out for your family? Click here for a 14 day free trial to see if No More To Go’s easy meal planning is a good fit for your family. Does this sound like something you and / or your family could use? Disclaimer: This post is sponsored by No More To-Go, regardless, all opinions are my own! The best of: Urban Outfitters 50% off sale! July 2016 PopSugar Must Have Subscription Box Unboxing and Review! OMG these dishes look absolutely DELICIOUS!!!!! I don't meal plan, but this sounds like an easy way to get started. I am not good at meal planning. I wait till the last minute to decide. I am not good either at daily meal planning just how I feel day by day. I have been trying to meal plan more, but by using items on sale. 🙂 I will have to check this service out. Each time I try to start meal planning I fail. I usually end up going back to my old ways. Oh I love this Idea. Sometimes meals do get a little boring, I love being able to create something new often. Sounds like a neat program 🙂 . That's awesome you like it. Those meals look so yummy! What a great option! I always start to week doing so well making meals and then as the end approaches I get lazy and that where the take out comes into play. I'm ashamed that last night was McDonalds! I'll have to check this out! Wow .Those dishes sound amazing .I'm terrible at meal planning and not so great at cooking .I'll have to check this out . The pork soft tacos are calling to me in a big, big way. I NEED them! Sounds like a nice option for families that don't have time to cook. Sounds interesting. No need to have a hard time thinking about what recipes to cook because it's all planned for you! Nice. This was an interesting meal planning, it save more time and effort to make easy those families who don't have time to prepare it! Those dishes looks so delicious! Those look like tasty dishes. I have never used a meal planner and it's worse now that I am single, empty-nester. I can certainly see how some, especially large families, might need one. Nice post. You had me hooked at pork tacos. I have no problems witn eating of the pig. Sounds like an interesting meal planning tool! I'll have to check it out. All the dishes looked yummy. No More To-Go sounds like a great program. I will check this out. This sounds interesting. I gave up meal planning because my husband, who's the cook in our houshold, got bored after a couple of days and just cooked what he fancied. More interesting meals might just win him over. I've never heard of this – sounds great, though – very helpful service. Nice that they have gluten-free and other specialty options, too. I'm a coffee loving sometimes-blogger, wife, and stay at home mom to an almost 4 year old tornado of a toddler and chunky one year old boy! I share my honest motherhood moments, favorite family goodies, and the helpful hints I've discovered through my journey and with the aid of my 'tribe'.